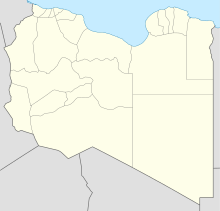 Habit Awlad Muhammad Airport is an airport in the Jabal al Gharbi District of Libya, located approximately 266 kilometres (165 mi) south-southwest of Tripoli in the Libyan desert. Its primary use is the transportation of oilfield workers from production facilities in the area. During World War II the airfield, then known as Tmed El Chel Airfield was used as a military airfield by the United States Army Air Force during the North African Campaign against Axis forces. ^ Airport information for Habit Awlad Muhammad Airport at Great Circle Mapper. ^ "Habit Awlad Muhammad Airport". Google Maps. Google. Retrieved 11 September 2018. Combat Squadrons of the Air Force, World War II Maurer, Maurer, ed. (1982) . Combat Squadrons of the Air Force, World War II (PDF) (reprint ed.). Washington, DC: Office of Air Force History. ISBN 0-405-12194-6. LCCN 70605402. OCLC 72556.